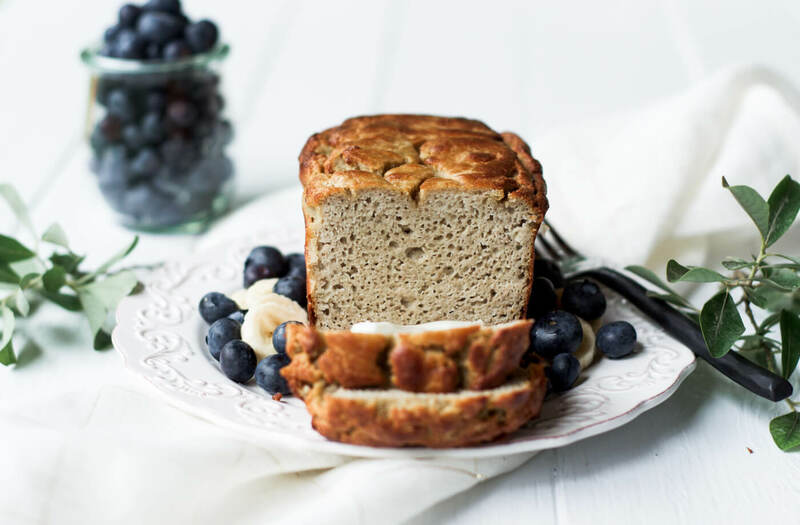 This Grain Free & Paleo Banana Bread is incredibly easy to make and it’s made in a blender! Light and airy bread with a delicious crust, this banana bread only takes 5 minutes to whip up and then it’s in the oven. I wasn’t originally going to share this recipe with you guys yet, but it is quickly becoming one of my favorites, so I just couldn’t wait! 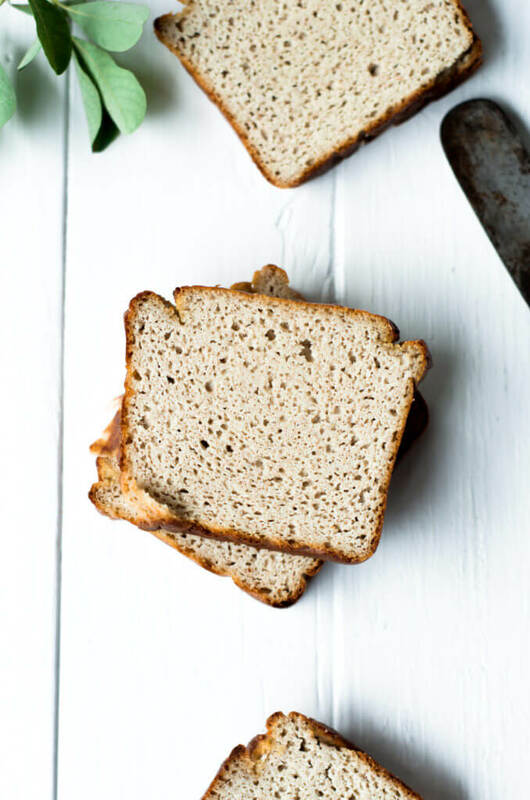 This bread is everything I want it to be: soft, light, fluffy, smooth, moist, and full of naturally sweet banana flavor. Mmmmm (licking lips). You guys have to get in on this party in the kitchen! This banana bread is a five minute blender recipe. One of my kind. Putting seven whole food ingredients into the blender or food processor, whipping it smooth, then letting it cook up in the oven, filling the house with soft banana breezes, is always the best kind of day. Eating banana for the first time in one year is an exciting sign that my health is being restored! Yaaaay! I don’t remember it tasting that good… or that sweet:) Bananas are a great way to keep paleo baked goods moist, plus the sugars in the banana create a gorgeous moist crust. This recipe has no added sugar, yay again! I used a bit organic stevia liquid to add a little more sweetness, but this is completely optional and it would be amazing without it too. 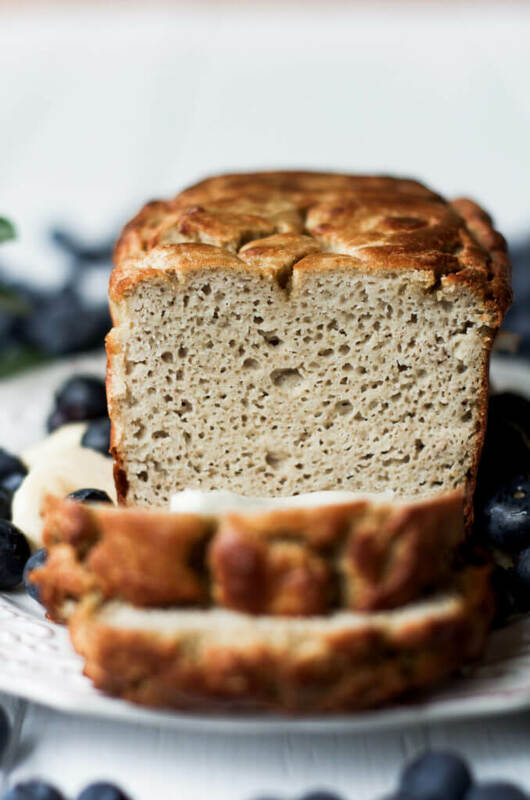 Having a list of quick and easy paleo bread recipes is a must for satisfying that occasional bread and butter craving, because who doesn’t have one? Yes, even veggie munchin rabbits like myself get the craving for a good old slice of bread from time to time. This recipe sure hits the spot! I store this banana bread sliced and in a zip lock in the freezer for further munching occasions. Eating the sugars from the banana mixed with lots of almond and egg protein help to balance out your body’s blood sugar levels as you are consuming sugar. A big shout out to grain free cooking! Who else loves all that protein and whole foods in your cakes and breads? I use my amazing high powered Kitchen Aid Food Processor for this recipe, but I have also made it in my Blendtec Blender. If you don’t have either of these, you should get one, because they are amazing and save so much time in the kitchen. 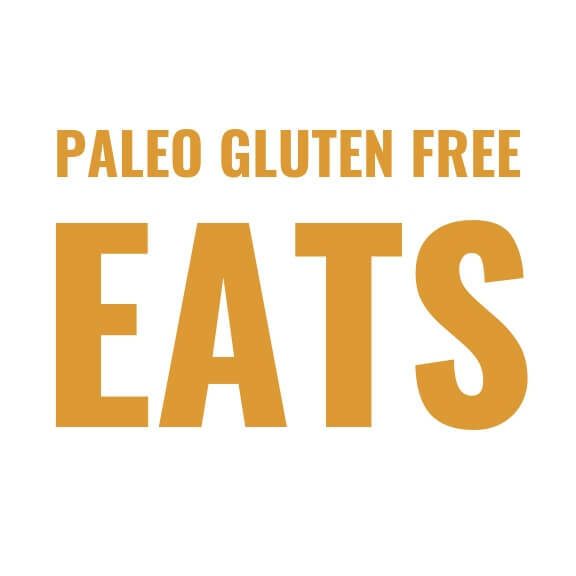 In conclusion, I wanted to share that I have recently released my new ebook, 5 Easy Paleo Breads. 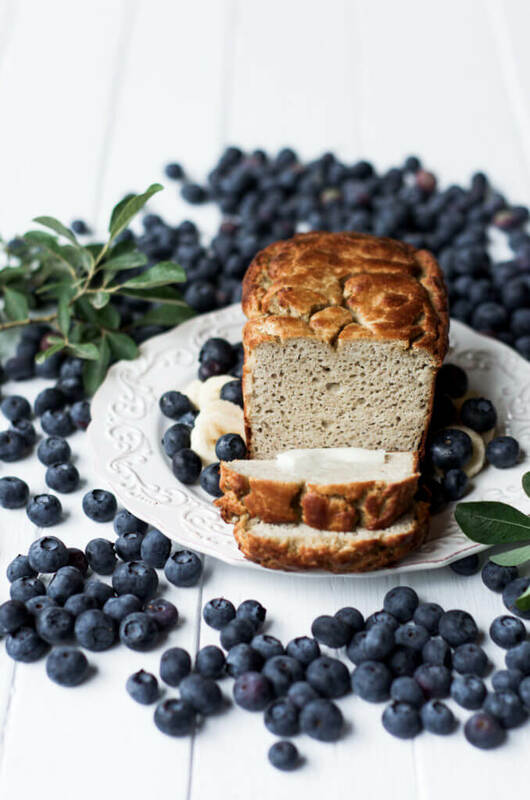 If you like this banana bread and want more grain free breads that taste real, be sure to check it out! And the great part is- the ebook is on sale 50% off for a few more days! In this ebook, I will show you how to make five of my top paleo breads; including, nut free and yeast free Paleo Bagel Bread, an epic loaf of Rustic Artisan Bread, and a few more that I think you’re going to like. (See all descriptions here). Be sure to cook this loaf in a 3 1/2" by 5" bread pan. If you cook it in a larger loaf pan it will turn out flat because it will spread farther in the pan. 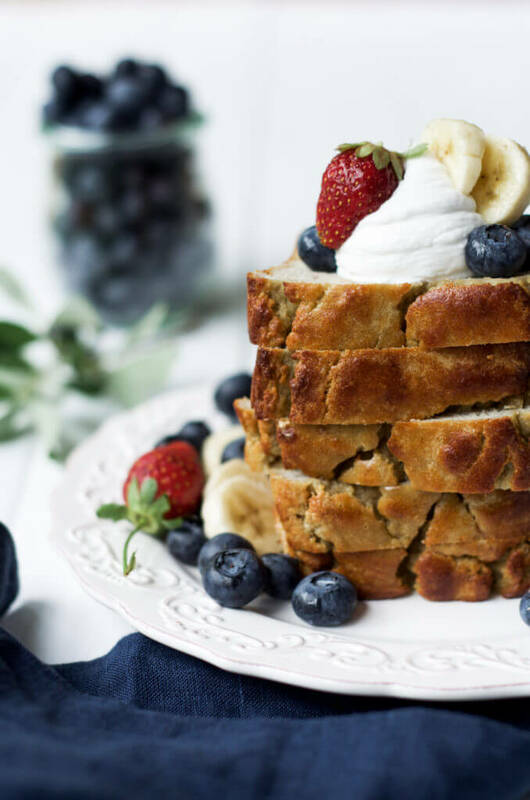 This looks like the most moist banana bread I’ve ever seen… I’m very curious to give it a try… Bravo for such beautiful photos! Can you substitutes the liquid stevia with anything else? Thanks! Hi Kenya, yes, you can for sure try trading the stevia for maple syrup or honey. I haven’t tried this myself, but I would probably use about 1/4 cup and add more if needed. Thank you for such a quick response! Definitely going to give it a try! Weekday can i substitute for almond flour. We have NUT ALLERGIES.! TOO MANY RECEIPES CALL FIR ALMOND FLOUR WHEN GLUTEN-FREE AND THAT DOESN’T CIVER MOST ALLERGIC PEOPL. THANK U.
Hi Cheryl, you can try subbing with a gluten free flour blend or maybe oat flour. I haven’t tried it myself. some bananas that could be used up and love banana bread. Thanks! Hi Joanne, You can definitely try substituting the stevia with coconut sugar. I haven’t tried it myself, so i cant say how it would turn out, but if I were making it with coconut sugar I would probably use about 1/4 and maybe a tablespoon or two. As far as the coconut oil goes, the measurement will be different depending if its liquid or solid, so I suggest putting some in the freezer to solidify before using in this recipe. Happy cooking! I’m thinking of making muffins instead of the loaf.. How long do you think it should bake? What is the best way to store them? Can these also be put in the freezer? Thanks! Mine didn’t rise, like at all. Any thoughts as to why? Hi Robin, I’m not sure… I haven’t had this problem before and I’ve made this recipe a million times (at least it feels that way:). Sorry you are having difficulties with it. Um, make sure you use all the eggs as described and maybe add some baking powder??? Enough for me. Super fast and easy to make. This will be my go to banana bread recipe! Thank you. Can this bread be made with coconut flour ? Actually I use similar recipe with coconut flour, but it is for banana walnut muffins. That one calls for 1/4 cup coconut oil (melted), and 1/4 cup coconut flour instead of almond flour. Everything else is pretty much the same. Just in case anyone still wants to try this recipe with that substitution.. You just can’t use coconut flour as a 1:1 sub of course. I LOVE the texture of this bread, but for some reason it came out only about an inch thick, not a beautiful loaf like your photos! I’ve reviewed the recipe numerous times, any idea of what I did wrong??! Wow! That is so weird, I have made this bread like a gazillion times and it has never done this before. Sorry you are having trouble. :( I’m not sure what went wrong… Make sure your oven is preheated and you add all the baking powder as directed. Did you use a blender? What size eggs did you use? This looks so good!! I have nut allergies, and I love almonds but they are a big no no, what kind of flour can I use? This looks so good!!! I have nut allergies, I love almonds but can not have any form of them, can the almond flour be substituted with something else? Hi – how are the carbs and potassium so low if there are two bananas in the recipe? Are they not included in the nutrition facts ? Love this idea! 2 Questions..
Can I sub agave for stevia? And coconut flour for almond flour? If either, what’s the conversion? Thank you!! Can’t wait to try it! Hi Julia, You can sub agave for stevia if desired… I haven’t tried it, but it should work:) As for subbing coconut flour for almond flour, this wont work, because coconut flour absorbs much more liquid then almond flour and the whole texture and consistency is completely different. Happy cooking! Mine came out very flat too, but it was still yummy! What size eggs did you use? Just made this- double the recipe since my pan was too big and I added walnuts. OHHH MYYYY GAAAAWD. My family and I ate it warm with some kerrygold butter. Best thing I’ve ever put in my mouth. I will be making this a lot. Like a lot a lot. Just made this, doubled the recipe (my pan was way too big) and added walnuts (because we LOVE walnuts!) and OMG it was sooooooooo good. We spread a little kerrygold butter on it while it was still warm and ugh <3 heaven! I just made these this evening, really lovely. The only change I made was to use coconut sugar as the sweetener. The recipe made 8 nicely-sized muffins. They came out just right after 25 mins in the oven. Thanks for sharing your recipe, I plan to experiment with applesauce muffins next using your method. Awesome! Great idea with the muffins Jen! If I have a egg allergy, would it work to use The Neat Egg – a natural vegan egg substitute? This recipe is great!! I added a little cinnamon , used a 6- mini loaf pan (had to double recipe) topped with blueberries. I freeze in individual bags and heat up in the microwave. Delicious!! I cannot have nuts or beans . Do you know what I could substitute the almond flour for? I haven’t tried subbing anything yet… you could try using a gluten free flour blend, but I haven’t done it, so I cannot say how it would turn out. The bread was great! But, it didn’t rise. I dbl checked all of the ingredients, and everything was fine. Any ideas of what went wrong? It only rose about 2 1/2 inches. Meredith, Did you use the correct size loaf pan that I indicated? Be sure to use the right size pan:) You can read the recipe notes and see the size loaf pan needed for this recipe. I hope that helps! So happy that I found this recipe link on Pure Wow. Whipped this bread up in less than 6 minutes. One of the best (and easiest) paleo bread recipes I’ve tried over the last five years (and I’ve tried a lot). Great texture that doesn’t fall to pieces when you slice it. Not too sticky like some paleo breads, and not too sweet. Perfect with apple butter or just by itself as a yummy breakfast treat. Followed the instructions and bake time (one hour) to a T. Will bake again! Thank you for this wonderful recipe. Is it easily doubled to make a larger loaf? Renee, I am not sure how it would double. I haven’t done it before, but I think it would work perfectly fine! Just cook it for a bit longer:) Happy cooking! For those whose bread didn’t rise…check and see if your baking powder has expired. Cynthia, We figured out that it was because they were using the wrong size bread pan:) Good tip though! Excellent! Light and moist, slices nicely, and has a wonderful texture. I used a tablespoon or so of pure maple syrup instead Stevia, and only needed to bake it for about 45 minutes rather than one hour. Next time I will double or triple the recipe as the recipe as is only makes a small 3″ x 5 1/2″ mini loaf, which is quite cute but won’t last long given its tastiness! Great recipe Kaylie, thank you! THIS IS AMAZING!!!! I make it once a week and have shared it with all of my paleo friendly friends!!! Everyone thinks it’s as amazing as I do!!!! Thank you so much for this EASY SIMPLE treat! A few people have mentioned that their bread turned out flat. I wonder if it is the size of the laof pan… at one point you say a small pan and I wonder if they are using a regular size loaf pan which would be bigger and, hence, create a flatter loaf. Yes, that is exactly what was figured out- thanks for bringing that up again. I specify that in the recipes notes, so everyone knows to use a small loaf pan. Hope you enjoy! Thanks for sharing Patricia! I am busy making my second loaf in two weeks. I have doubled the amount and put it in a larger loaf pan both times, and it has worked out perfectly. It just requires a longer cooking time. I also put sunflower and poppy seeds on the top for crunch which works really well. Sometimes I will warm up a slice and have it with whipped cream. Thank you for a delicious recipe. The first time I made this, it was super tasty but didn’t rise. I followed the recipe to a T. The second time, being that I live at high altitude, I added about 1/2 cup more of almond flour, and a 1/2 tsp more of baking powder and it did rise up. I did add some chopped pecans and cacao chips and it is wonderful! Hi Megan, What size loaf pan did you use? This banana bread is meant to be made on a mini loaf pan, that is probably why it didn’t “rise”. 🙂 If you make it in a regular loaf pan it just kinda spreads out. I can’t have coconut oil. Is there anything I can sub? Are those calories for the ENTIRE loaf or a slice? It’s per slice, but there are that many calories because the almonds used instead of regular flour. Don’t worry though, because there is so much protein in it- it can be eaten by itself and it provides 6g protein/slice! Lots of health benefits from the healthy fats as well. Are those calories for the ENTIRE loaf or a slice? Im on the nutrimost program and i am thrilled to try this. But, i jave to count calories. Did i miss your note somewhere on calories? Also, if we are using a regular bread loaf pan, 9×5, do i need to double or triple it? Thanks! You may have already addressed this, but since I didn’t want to take the time to read all of the many comments you have received, I wondered if the recipe could be doubled so it can be made in a regular sized loaf pan. I don’t have that small of a pan. Also, is it possible to substitute powdered Stevia somehow in place of the liquid Stevia? Wow, this looks incredible – and easy! I just made two loaves it’s so moist .My rise fine. I’m not much of a cook, but this was easy. I added bits of chocolate in the mix and left it in the oven for 10 minutes extra – turned out fine. Simple, healthy and delicious! Thank you for including the nutritional information, but what exactly is considered a serving? Thank you! There are 8 slices in this- each are considered a serving. I just had a quick question.. it seems a little silly but are the calories based off just one slice of bread? Fresh blueberries are abundant right now and I was wondering if I can add some to the recipe? If so, how much would you suggest I add, and would I have to alter anything else in the recipe? Thanks! I’m interested in cutting out gluten, and am SO GLAD to have this recipe! When I’ve made normal banana bread in the past, it’s always with bananas that have been sitting on my counter for a couple weeks so they’re extra mushy. Do you use fresh yellow bananas, or overripe brown ones? Hi Allie, I use either or. They both work. 🙂 Sometimes I use frozen babas and thaw them out and use them too! This is the best almond flour banana bread recipe I have found! Turned out amazing. I love it!! The banana bread recipe looks great, but I can’t have stevia on the SCD. I can use honey only, any idea who much to use instead of the stevia? I realize the bananas are sweet, so maybe not too much. You could probably sub for 2-3 tablespoons honey. This is a great recipe. I converted it to muffins, made about 8 and baked for 25 minutes or so. Not gonna lie, I added some chocolate chips to the top and a handful of chopped pecans! But YUM! thank you! The nutritional facts, is the carbs per LOAF..or slice? !?! Thank you! Is anyone else having a hard time reading the ingredients? They seem to be obscured and all over the place so I can’t make out exactly what I need. Hi Elle, sorry to hear the display is giving you problems- I would love to help figure out what is going on. Would you be able to tell me what device you are viewing on? Thanks! Sorry for the inconvenience. Hi! 2 questions:)… How many slices is one serving? And how do I store if I made it the night before? Hi Kylie, one slice per serving and you can just store on top of the fridge covered in plastic wrap. I would suggest storing in the freezer if you plan on saving it for more than 2-3 days. This is the best banana bread I have ever had. I love it, but more than anything I love how easy it is to make. I don’t freeze mine, because I can’t keep it long enough, but do keep it in the refrigerator. Do you think I could try it with pumpkin purée instead of bananas? So glad to hear that you love it! You could try canned pumpkin… not sure if it would be sweet enough. Storing in the fridge will work great for a few days. Looks amazing, I’ll try. What’s the difference between using blanched vs unblanched almond flour? I don’t know which one I have in my glass flour jar. Thanks! Hi Ella, either one will work- the blanched almond is a lighter color, because the skins have been blanched and peeled. I like using this one best! But again, either one will work. Hi Vee, you could try . gluten free flour blend. I haven’t tried this recipe with another flour, so I’m not sure what would work 100%. I did not look at the pan measurement recommendation. My bad, but it still taste good. Even my picky 4 year old wanted a few slices. I used liquid agava because that’s what I have on hand. I’m tempted to try to make pancakes from this since the batter is thin. Thanks for this tasty recipe. I tried these today and the texture was very smooth, however I recommend you not eat them till they are cooled all the way. but all around a great and easy recipe!!! Hi, how would this turn out in a mini muffin pan? Hi Amber, that should work great- just be sure to watch the cooking time, because it will be a lot less! Can this recipe or any other recipes for bread be done in a nu wave oven? Hi Yvette, I am not familiar with type of oven, so I cannot say. Sorry. If I doubled the recipe could I use a regular, larger, loaf pan? Hi!!!!! It sounds really great!!! Iam gonna try it soon! How can I replace the cococunut oil?? Can I use Olive oil?? Thanks!!!! Hi Maria, olive oil may work- also palm oil is a good sub! Hi! Is there any substitute to the baking powder? Maybe arrowroot powder? Hi Kaylie, I’ve been searching for a good banana bread recipe and thank you for this one! I can’t wait to try it. In my opinion, I can’t stand the after taste of stevia. Instead I use Xylitol. It tastes and looks exactly like sugar and absolutely no after taste. It’s made from North American hardwood trees. Fantastic in coffee too. Hi! Love your blog and tried 2 of your recipes last night 🙂 The banana bread tastes great but mine did not rise. I followed your instructions exactly (except omitting stevia for honey). While I was making it, I realized that my almond flour was unblanched. Could that be why it didn’t rise? It is small like a biscotti so I’m still enjoying it. Hi Nicole, what size bread pan did you use? Be sure to use a small 3 1/2″ by 5″ bread pan. So easy, I use 1/2 cup of almond left over from making almond milk. Waste not want not. I’m on my third loaf. Hi Amanda, if you add cocoa flour, you will need to add more sweetener. Not sure how well that will go over… 🙂 You could experiment. I would add equal parts cocoa + sweetener (maple syrup or honey) probably 1/4 cup. Absolutely loved this recipe! Super easy and my bread came out perfect. Moist but still held together really well. I substituted the stevia liquid for coconut sugar. I used two table spoons and was plenty sweet! The best banana bread ever!!!! So easy and never fails. I have tried so many recipes and none have been as tasty and easy as this one. Thank you!!! Just wanted to leave a note with my modifications if you don’t have a mini loaf pan. This bread turned out amazing! I doubled it and poured it into an 8 x 8 cake pan. I also used 1/4 cup maple syrup (remember this is a double recipe) because I didn’t have stevia. I baked it for 30 min at 375 then an additional 15. It rose and browned beautifully! My whole family enjoyed it including my 3 year old. Thank you Kaylie! Great to hear, thank you Melissa! Could I use honey instead of the liquid stevia? Yes! I would use 1-2 tablespoons. Thanks for sharing this recipe-I can’t wait to make it! Question: could I use a muffin pan to make muffins with recipe you think? Many thanks Kaylie!!! is is an EXCELLENT recipe! I followed it to the letter and every time I got perfect results. I bought four small bake pans of recommended size, it was so worth it! I quadruple the recipe and bake 4 small cakes on weekends. My sons love it!! We enjoy it as a high protein and delicious breakfast choice for weekdays!! I only read the banana bread so far I know that I will try that one because I always make banana bread. I always need a good banana bread recipe! So I read some of the comments and doubled the recipe and put it in a 4×8 loaf pan. It’s making me a little nervous because it almost filled the pan? Still gonna be ok? Just did this and it came out great! At first i didn’t double the recipe and I could tell it would come out really flat, so I decided to double it and it came out beautiful and delicious! Do you have a recipe like this for zuchinni bread? Hi Linda, yes! Here is is: https://paleoglutenfree.com/recipes/5-minute-paleo-zucchini-bread/ Enjoy! This turned out great! I used a tablespoon of maple syrup instead of the stevia, and made muffins because I didn’t have the mini loaf pan. They were perfect at 25 minutes, and the taste and texture are superb! Thank you for a fantastic recipe! Just made this and it came out PERFECT! I used half almond and half coconut flour instead. And I used 3 tablespoons of honey instead. It came out really great and moist! Thank you!! I made the bread today, I doubled the recipe. It was very moist and yummy, super easy if you follow the recipe exactly. Be sure to allow more cooking time if you double the recipe and use the correct size baking pan. Thank you so much for the recipe. Yum! I made into 24 mini muffins because the kids love mini anything. I baked for 15 min. Very moist! Thank you for the great recipe! Hi Alice, it will turn brown and that’s totally fine- you just want it to be cooked in the middle. You will know it is finished cooking when a clean knife inserted into the center of the loaf comes out clean. Hi!! What’s the difference between blanched and regular almond flour? Can I use regular almond flour instead? Hi Tom, That sounds like it should work! Just watch the cooking time.